Welcome to my blog on www.fishpc.com. Please be sure to check back for the latest information. You'll be able to see seasonal action and news. I'll announce opening and closing seasons of the Gulf of Mexico's favorite fish species. Be sure to contact us if you have any questions. Come and join us for a fun, memorable fishing trip! The 2019 fishing season is here. Panama City Beach is completely back to normal and there are plenty of hotel, condo, and beach home rooms available to stay. All restaurants are open and all family fun places are ready for your enjoyment. 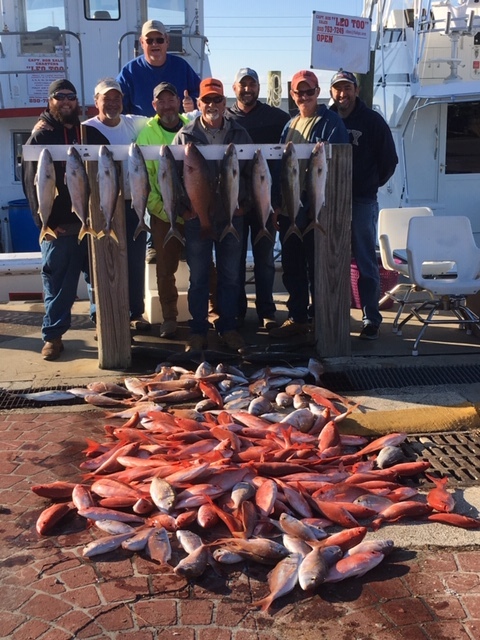 While the fishing fleet sustained some damage most of the boats are ready to fish and the rest will be by red snapper season. Capt Anderson's Marina is fully open for business and the LEO TOO is ready to take you fishing. Fishing has been good since the storm and we are expecting a great season. The red snapper season will open June 1 and is expected to be the longest in many years. Long term weather predictions are for good weather this year so call today to book your family or business fishing trip and vacation. Fishing days are filling so call to reserve the day you want. This is the first trip of 2019 taken on 1-13-19. Fishing is great!! !